With its adjustable fit handle, and ability to handle small, tight spaces whilst still giving a good quality finish, the Genesis GBS321A is the sander for all seasons. 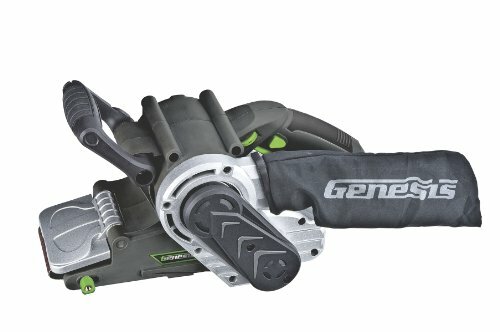 Whether you're looking for a reliable tool kit staple for general home use, or something that can handle a high volume of hobbyist work, or even if you're just starting out as a professional carpenter or handy person, and want something cheap but reliable to get you on your way, the Genesis is the sander for you. The Genesis is versatile and powerful enough to tick the boxes on most anyone's “must-haves” for a belt sander. From the householder who just wants to know they have something available should they need one, to the individual starting out in a professional woodworking career, the Genesis represents quality and value. In fact, the GBS321A does everything it says it does and more. Designed for comfort and control, the GBS321A doesn't disappoint on either front. It also features a fast and easy-to-use belt change system, ideal when time is a priority, and you want to spend as much of it as possible actually working on your project, rather than fiddling around with your tools. Most importantly – the belt doesn’t get jammed in the machine and everything works perfectly fine.